NRS 706.8818: Appointment, number, terms, qualifications and compensation of members; principal office; regulations. NRS 706.88182: Adoption of regulations establishing program for transportation of elderly persons and persons with permanent disabilities. NRS 706.88185: Investigation of alleged violation; hearing; cease and desist order; enforcement of order. NRS 706.8819: Hearings and final decisions; jurisdiction; appeals from final decisions. NRS 706.882: Appointment; classification; removal; restrictions on other employment. NRS 706.8821: Powers and duties; employees. NRS 706.88235: Issuance and enforcement of subpoenas; depositions. NRS 706.88237: Power of Taxicab Authority to determine circumstances requiring temporary increase in allocation and to make such allocations. NRS 706.8824: Allocation of number of taxicabs by Taxicab Authority: Factors for determination; limitations; annual review. NRS 706.88245: Temporary increase in allocation of number of taxicabs by Taxicab Authority; factors for determination; regulations. NRS 706.8825: Taxicab Authority Fund: Creation; deposits; use; petty cash account. NRS 706.8826: Revenue of city and county received from taxes imposed on businesses operating taxicabs payable to State; fees payable to State by holder of certificate for allocated taxicab. NRS 706.8818 Appointment, number, terms, qualifications and compensation of members; principal office; regulations. The Taxicab Authority, consisting of five members appointed by the Governor, is hereby created. Except as otherwise provided in NRS 232A.020, the term of each member is 3 years and no member may serve for more than 6 years. No more than three members may be members of the same political party, and no elected officer of the State or any political subdivision is eligible for appointment. Each member of the Taxicab Authority is entitled to receive a salary of not more than $80, as fixed by the Authority, for each day actually employed on work of the Authority. While engaged in the business of the Taxicab Authority, each member and employee of the Authority is entitled to receive the per diem allowance and travel expenses provided for state officers and employees generally. The Taxicab Authority shall maintain its principal office in the county or area of the State where it performs most of its regulatory activity. The Taxicab Authority may adopt appropriate regulations for the administration and enforcement of NRS 706.881 to 706.885, inclusive, and, as it may deem necessary, for the conduct of the taxicab business and for the qualifications of and the issuance of permits to taxicab drivers, not inconsistent with the provisions of NRS 706.881 to 706.885, inclusive. The regulations may include different provisions to allow for differences among the counties to which NRS 706.881 to 706.885, inclusive, apply. Local law enforcement agencies and the Nevada Highway Patrol, upon request of the Authority, may assist in enforcing the provisions of NRS 706.881 to 706.885, inclusive, and regulations adopted pursuant thereto. NRS 706.88182 Adoption of regulations establishing program for transportation of elderly persons and persons with permanent disabilities. The Taxicab Authority shall adopt regulations establishing a program for the transportation by taxicab of elderly persons and persons with permanent disabilities. The program must require the Administrator to establish, maintain and make known a telephone number for elderly persons and persons with permanent disabilities to register complaints regarding transportation by taxicab. NRS 706.88185 Investigation of alleged violation; hearing; cease and desist order; enforcement of order. When the Taxicab Authority has reason to believe that any provision of NRS 706.881 to 706.885, inclusive, is being violated, the Taxicab Authority shall investigate the alleged violation. After a hearing the Taxicab Authority may issue an order requiring that the certificate holder cease and desist from any action that is in violation of NRS 706.881 to 706.885, inclusive. NRS 706.8819 Hearings and final decisions; jurisdiction; appeals from final decisions. (d) Applications to change the total number of allocated taxicabs in a county to which NRS 706.881 to 706.885, inclusive, apply; and appeals from final decisions of the Administrator made pursuant to NRS 706.8822. NRS 706.882 Appointment; classification; removal; restrictions on other employment. The Director of the Department of Business and Industry shall appoint a Taxicab Administrator from a list of three names submitted to him by the Taxicab Authority. The Administrator serves at the pleasure of the Director. The Administrator is in the unclassified service of the State. The Taxicab Authority may remove the Administrator for good cause shown. Except as otherwise provided in NRS 284.143, the Taxicab Administrator shall devote his entire time and attention to the business of his office and shall not pursue any other business or occupation or hold any other office of profit. (Added to NRS by 1969, 1240; A 1971, 582, 1444; 1979, 937; 1981, 1286; 1993, 1926; 1995, 2318) NRS 706.8821 Powers and duties; employees. The Administrator is responsible for the control and regulation of the taxicab industry in any county to which NRS 706.881 to 706.885, inclusive, apply and for the administration of NRS 706.881 to 706.885, inclusive. NRS 706.88235 Issuance and enforcement of subpoenas; depositions. Whenever the Taxicab Authority or the Administrator is authorized or required by law to conduct a hearing, the Administrator may issue subpoenas requiring the attendance of witnesses before the Authority or the Administrator, respectively, together with all books, memoranda, papers and other documents relative to the matters for which the hearing is called and take depositions within or without the State, as the circumstances of the case may require. The district court in and for the county in which any hearing is being conducted may compel the attendance of witnesses, the giving of testimony and the production of books and papers as required by any subpoena issued by the Administrator. (c) That the witness has failed and refused to attend or produce the papers required by subpoena before the Taxicab Authority or the Administrator in the hearing named in the subpoena, or has refused to answer questions propounded to him in the course of the hearing, and asking an order of the court compelling the witness to attend and testify or produce the books or papers before the Authority or the Administrator. NRS 706.8824 Allocation of number of taxicabs by Taxicab Authority: Factors for determination; limitations; annual review. In determining whether circumstances require the establishment of a system of allocations or a change in existing allocations, the Taxicab Authority shall consider the interests, welfare, convenience, necessity and well-being of the customers of taxicabs. Whenever circumstances require the establishment of a system of allocations, the Taxicab Authority shall allocate the number of taxicabs among the certificate holders in the county in a manner which reflects the number of taxicabs operated by each certificate holder during the 5 years immediately preceding the date of establishment of the Taxicab Authority in the county. Whenever circumstances require an increase in the existing allocations, the Taxicab Authority shall allocate the additional taxicabs equally among all the certificate holders who apply from the area to be affected by the allocation. Unless a certificate holder puts the additionally allocated taxicabs into service within 30 days after the effective date of the increased allocation, the increased allocation to that certificate holder is void. The Taxicab Authority may attach to the exercise of the rights granted by the allocation any terms and conditions which in its judgment the public interest may require. The Taxicab Authority may limit: (a) The geographical area from which service is offered or provided. (b) The hours of service. Such a limitation must not reduce hours of service to less than 12 consecutive hours in a 24-hour period. If a limitation is placed on an allocation, taxicabs must be marked in a distinctive manner that indicates the limitation. NRS 706.88245 Temporary increase in allocation of number of taxicabs by Taxicab Authority; factors for determination; regulations. In determining whether circumstances require a temporary increase in the number of taxicabs allocated pursuant to NRS 706.8824, the Taxicab Authority shall consider the interests, welfare, convenience, necessity and well-being of the customers of taxicabs. Whenever circumstances require a temporary increase in the number of taxicabs allocated pursuant to NRS 706.8824, the Taxicab Authority shall allocate the temporary increase equally among the certificate holders in the area to be affected by the allocation. The Taxicab Authority shall determine: (a) The number of additional taxicabs to be allocated; (b) The hours of operation of the additional taxicabs; and (c) The duration of the temporary allocation. NRS 706.8825 Taxicab Authority Fund: Creation; deposits; use; petty cash account. All fees collected pursuant to NRS 706.881 to 706.885, inclusive, must be deposited by the Administrator to the credit of the Taxicab Authority Fund, which is hereby created as a special revenue fund. The transactions for each county subject to those sections must be accounted for separately within the Fund. The interest and income earned on the money in the Fund, after deducting any applicable charges, must be credited to the Fund. The revenues received pursuant to subsection 1 of NRS 706.8826 are hereby appropriated to defray the cost of regulating taxicabs in the county or the city, respectively, making the deposit under that subsection. The fees received pursuant to subsection 3 of NRS 706.8826, NRS 706.8827, 706.8841, 706.8848, 706.8849 and 706.885 are hereby appropriated to defray the cost of regulating taxicabs in the county in which the certificate holder operates a taxicab business. Any balance remaining in the Fund does not revert to the State General Fund. The Administrator may transfer to the Aging Services Division of the Department of Health and Human Services any balance over $200,000 and any interest earned on the Fund, within the limits of legislative authorization for each fiscal year, to subsidize transportation for elderly persons and persons with permanent disabilities in taxicabs. The money transferred to the Aging Services Division must be administered in accordance with regulations adopted by the Administrator of the Aging Services Division pursuant to NRS 427A.070. NRS 706.8826 Revenue of city and county received from taxes imposed on businesses operating taxicabs payable to State; fees payable to State by holder of certificate for allocated taxicab. The board of county commissioners of any county in which there is in effect an order for the allocation of taxicabs from a taxicab authority, and the governing body of each city within any such county, shall deposit to the credit of the Taxicab Authority Fund all of the tax revenue which is received from the taxicab business operating in the county and city, respectively. For the purpose of calculating the amount due to the State under subsection 1, the tax revenue of a county does not include any amount which represents a payment for the use of county facilities or property. CCC 20.08.060 Solicitation of fares prohibited. NAC 706.495 Taxicabs: Two-way radios; requests by telephone for service. NAC 706.531 Drivers: Display of permits. NAC 706.534 Drivers: Failure to possess valid permit. NAC 706.540 Drivers: Standards of appearance and dress. NAC 706.555 Drivers: Use of taxicab for crime. It shall be unlawful for any person to refuse to pay the legal fare of any taxicab after hiring the same, and it shall be unlawful for any person to hire any taxicab with the intent to defraud the person from whom the same is hired of the value of such services. LVMC 11.60.040 Taxi stopping, standing or parking. LVMC 11.60.050 Taxistands -- Use required. It is unlawful for any person to park a vehicle, as herein defined, for the purpose of seeking or awaiting employment in any place upon the streets in the City, other than at stands designated therefor, as herein provided, and marked by appropriate signs and curb painting by the Traffic Engineer. LVMC 11.60.060 Taxistands -- Establishment -- Use rules. The Traffic Engineer shall, upon the order of the City Manager, establish such stands in such places on the streets and in such number as the City Manager shall determine to be of the greatest benefit and convenience to the public; provided, however, that such stands shall not exceed in length four vehicles spaces along any block face, and provided further that not more than two cabs from any one cab company may occupy such spaces at the same time, and, in the event only two vehicle spaces are adjacent to one another in any such stands, no two cabs from any one cab company may occupy such stand at the same time. All stands as herein provided shall be so-called "open stands," meaning that no given cab company shall have any superior right to occupy any particular stand over any other cab company. It is unlawful for any person to engage in any of the following acts of disorderly conduct: Participate in a fight; Challenge another person to fight; Use profane, indecent or obscene language in addressing another person; Commit a breach of the peace; Incite a disturbance; Interfere with, annoy, accost or harass any other person which conduct by its nature would tend to incite a disturbance. CCC 15.16.010 Items left in taxicabs. A. SEARCH. The driver of any taxicab shall make reasonable search of the interior of the taxicab at the termination of each trip. B. REPORT OF ITEMS FOUND. 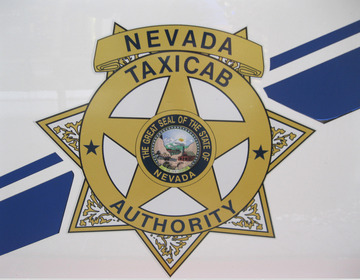 All taxicab drivers shall make immediate report to the offices of their employers on the finding any any package, article, baggage, or goods of any kind, left in the taxicabs of which they are in charge, and as soon as possible thereafter, turn any such item so found over to their employers, who in turn shall report the same to the Las Vegas metropolitan police department. The employees of said taxicab drivers shall retain possession of said property in safe keeping to be disposed of pursuant to applicable law. C. REPORT ON FILE WITH THE LAS VEGAS METROPOLITAN POLICE DEPARTMENT. The Las Vegas metropolitan police department shall keep a report in their files of all items left in cabs. A. The “Rules of the Road” set forth in Chapter 484 of the Nevada Revised Statutes at NRS 484.251, et seq., as amended, and Title 14 of this code shall be applicable to and shall govern motor vehicle operation upon the real property known as McCarran International Airport or upon other county airports as if the roadways were dedicated and considered highways under said statutes and Title 14 except as otherwise provided by those regulations set forth in or promulgated pursuant to this chapter. It is the duty of the police officers to enforce all traffic regulations and of the police officers and parking enforcement officers, and officers of the Taxicab Authority (as defined in NRS 706.8821(3)) to enforce all nonmoving traffic regulation governing the airport. The above-referenced officers may order the immobilization or towing and/or impoundment of any vehicle found to be in violation of any of the traffic regulations as permitted by law or any vehicle found on airport property which has outstanding fines due to judgments obtained upon previous violations. B. The director of aviation is authorized to issue operating directives to create various parking, no-parking, or loading and unloading zones at the airport which may be based upon vehicle size, type or purpose. The director of aviation is also authorized to establish time limits and color codes for curb painting, if applicable, for all such zones. All parking, no-parking, loading and unloading zones shall be designated by standing signs and/or by paint upon the curb, the forms and colors of which shall be set forth by operating directive, in order to be visible to the general public. If a roadway does not have curbing, standing signs shall suffice. Parking meters may be used in lieu of said standing signs and paint. A. No person shall cause, allow, permit or suffer any vehicle to be parked in any restricted location, as set forth in this chapter or in any operating directive, or in any zone designated as a “No-parking zone,” or in any location designated as a “No-stopping lane,” or in any space or area not designated by the director of aviation for that particular vehicle. B. No person shall cause, allow, permit or suffer any vehicle operated or parked by any person to be parked beyond the period of legal time purchased with the deposit of the specified coin or coins in a parking zone controlled by a parking meter; or to fail to pay or to deposit with the attendant at the public parking lot exits the sum required by this section to be remitted for parking privileges at the airport unless that person's parking voucher or stub has been validated by the director of aviation or his designee; or to be parked in any space controlled by a parking meter. C. No person other than a person in a vehicle displaying a special handicapped license plate or parking permit issued pursuant to NRS 482.384 or 482.3845 or an officially recognized emblem issued by the state of Nevada or another jurisdiction indicating that the driver or a passenger in the vehicle is eligible shall stop or park a motor vehicle in any space where signs are posted or curbing is painted limiting parking to handicapped only. An operator of a vehicle displaying a handicapped parking permit, special plates or official emblem may park in any authorized parking space on the airport roadway system for a period not to exceed four hours. This section does not authorize the parking of such vehicles in the airport public parking lot without paying the required fee for the time during which the vehicle is so parked. Vehicles found in violation of this subsection may be cited by notice of infraction and may, in addition, be towed and/or impounded, at the owner's sole cost and expense. CCC 20.08.030 Parking--Loading and unloading of vehicles at airport. The established fees, if any, required for use of the airport property have been paid by the owner, driver and/or operator. B. No person shall park or stop a vehicle while awaiting ingress to the area designated for the loading or unloading of passengers and/or cargo therein except in the holding/staging lanes which may be designated and posted for such purpose. C. No person shall park or stop a vehicle for the purpose of picking up and/or discharging passenger(s) desiring access to the airport except in the areas so designated for that type of vehicle and for that purpose, except that the stopping of a vehicle for such purpose may be authorized by the director of aviation by written operating directive in an area if the vehicle is immediately adjacent to another vehicle which is legally stopped at a curb which has been designated for the picking up and/or discharge of passenger(s). In no instance shall a vehicle stop in any travel lane to either discharge or pick up a passenger(s) or cargo. Diagonal parking is not permitted across designated lane markings. D. No person shall leave a vehicle unattended in any area upon the airport unless the vehicle is in an area designated by the director of aviation for parking and leaving the vehicle. The vehicle may only be parked in the area for the posted time period. E. No person shall leave a vehicle running when parked in an area where vehicle shut-off signs are posted. Solicitation of fares by vehicle operators, skycaps or any airport tenant representative, or any other individual without the written permission of the board of county commissioners or the director of aviation is prohibited. “Solicitation of fares” means asking, inviting or inducing persons by voice or action, other than those persons holding prearranged, bona fide, reservations or those to whom taxicabs have been duly dispatched by the supervising taxicab authority or by a certified taxicab company, if they desire transportation. The violation of this regulation shall be a misdemeanor. (d). The person requests a destination that is outside of the area within which the driver is able to communicate with the central dispatch facility described in NAC 706.3743. No person other than the driver may be allowed within any taxicab unless that person is a passenger who is actually being transported and is paying a fare, unless that person is another taxicab driver being transported to or from his shift as a taxicab driver. Passengers in a taxicab must have the exclusive use of the vehicle while being transported. A driver shall not, while traveling to the destination of a passenger, take a route that is longer than necessary, unless such a route is requested by the passenger. Shall not engage in verbal arguments or acts of physical violence. Shall refrain from backing into position in any taxicab stand. Shall refrain from loading passengers at any establishment where a taxicab stand has been established unless he has been through the rotation of the stand. This provision does not apply when there are no taxicabs on the stand. Shall not allow more than two passengers in the front seat of his taxicab and shall not allow more than five passengers in his taxicab at any one time. Shall not knowingly operate a taxicab equipped with a faulty or inaccurate taximeter or a taximeter that shows signs of having been tampered with. Shall not operate a taxicab in which the taximeter is not sufficiently illuminated or the face of the taximeter is obscured to the extent that the entire fare recording device cannot be easily seen by the passenger. Shall not operate a taxicab in which the taximeter does not have a properly attached seal as affixed by the transportation services authority. Shall not operate a taxicab that does not have properly affixed a valid “TX” plate as issued by the transportation services authority. Shall not operate a taxicab if the driver is suffering from any illness or physical or mental disorder that may impair his ability to operate a taxicab safely. Shall not operate a taxicab while taking drugs that may impair his ability to operate a taxicab safely. Shall keep a complete and accurate trip sheet as prescribed in NAC 706.3747. Shall not display or distribute any advertising within or on his taxicab that has not been authorized by his employer. A driver of a taxicab shall not willfully, knowingly or intentionally use his taxicab or his employment to facilitate the commission of a crime, or allow the use of his taxicab by another person as a means of facilitating the commission of a crime. Whenever a taxicab is involved in an accident, the authority must be notified immediately and the cab inspected by the authority or its designee. The two-way radio in each taxicab of a certificate holder must be turned on and audible at all times. A certificate holder shall provide reasonable service to persons who make telephone requests for service if that service is within the limits of the holder’s certificate. A driver shall display his permit to the left of the rate schedule in the bracket or holder provided for that purpose at all times while on duty. The permit must be displayed in an upright position and facing the passenger for an unobstructed view and so it may be easily read. Any person who is found by the administrator to be operating a taxicab without having in his possession a valid driver’s permit is in violation of NAC 706.513. A taxicab, found by the administrator to be operated by a driver without a valid driver’s permit, may be taken out of service until put back in service by a driver who has a valid permit. Any driver in possession of an altered or defaced permit will not be considered to be in possession of a valid driver’s permit. Any driver who is found by the administrator to have committed any violation of an applicable law or regulation while his permit is expired, is subject to hearing and appropriate disciplinary action. Certificate holders shall submit to the authority a proposed standard of dress and appearance for its drivers. Upon approval by the authority, each certificate holder will be responsible for maintaining those standards of dress and appearance for its drivers. A driver who fails to meet the standards of dress set by his employer as approved by the authority shall be considered by the authority to be in violation of subsections 1 and 2 of NRS 706.8845. Not engage in verbal arguments or acts of physical violence. Refrain from backing into position in any taxicab stand. Refrain from loading passengers at any establishment where a taxicab stand has been established unless he has been through the rotation of the stand. This provision does not apply if there are no cabs on the stand. Not permit more than two passengers in the front seat of his taxicab and not permit more than five passengers in his taxicab at any one time. Not knowingly operate a taxicab equipped with a faulty or inaccurate taximeter, or that shows signs of having been tampered with. Not operate a taxicab in which the taximeter is not sufficiently illuminated or the face obscured to the extent that the entire fare recording device cannot be easily seen by the passenger. Not operate a taxicab in which the taximeter does not have a properly attached seal as affixed by the administrator. Not operate a taxicab that does not have properly affixed a valid medallion as issued by the administrator. Not operate a taxicab when any illness or physical or mental disorder may impair his safe operation of a taxicab. Not operate a taxicab while taking drugs that may impair his ability safely to operate a taxicab. Keep a complete and accurate trip sheet as prescribed in NAC 706.510 and 706.549 and NRS 706.8844. Not display or distribute any advertising within or on his taxicab which has not been authorized by his employer. A driver of a taxicab shall not work a period of duty longer than 12 consecutive hours except when under a charter or a trip, the charter or trip having commenced within a reasonable period before the end of the driver’s period of duty. Under no circumstances may a driver work longer than 16 hours within a 24-consecutive hour period. A driver who has completed a period of duty of 8 hours or more must not be knowingly permitted or required to resume driving unless the driver has been off duty for at least 8 consecutive hours. A certificate holder shall not knowingly require or permit any driver of a taxicab to work longer than 12 consecutive hours, except as provided in subsection 1. Each certificate holder shall provide an appropriate, accurate and operable time clock. The time clock must be approved by the authority before its use, and the certificate holder shall require its drivers to time stamp their trip sheets at the beginning and end of each of their periods of duty. The permit number of the driver. Each driver shall conduct a search of the interior of his taxicab at the termination of each trip. If the driver discovers any property of a passenger in the taxicab, the driver shall immediately report the property discovered to his employer and, as soon as practicable, deliver the property to his employer. The employer shall maintain the property in his possession and dispose of the property in the manner provided by law. Ensure that the electronic taximeter of his taxicab is engaged while the taxicab is on hire. Not solicit passengers by voice or action. Not accept, directly or indirectly, a gratuity or any form of compensation from any person for diverting or attempting to divert a prospective customer from any commercial establishment. Not knowingly operate a taxicab that is unsafe for passenger service. Upon changing employment from one certificate holder to another, present to the administrator his permit and a referral slip from his new employer for issuance of a permit. Before commencing his employment, a taxicab driver must present his taxicab driver’s permit to his employer. Except as otherwise provided in NAC 706.546, not operate a taxicab within the jurisdiction of the authority for other than the company listed on his driver’s permit. Report immediately any inoperable or defective taximeters to the certificate holder or his representative. Not divert or attempt to divert a prospective customer from any commercial establishment. Except as authorized by his employer or the authority, not permit any person, other than himself, within his taxicab unless that person is a passenger who is actually being transported and is paying a fare. A taxicab driver must not willfully, knowingly or intentionally use his taxicab, or his employment to facilitate the commission of a crime, or permit the use of his taxicab by another, as a means of facilitating the commission of a crime. Did you Know: As of March 2019, Benson & Bingham have 32 reviews and a 5-Star rating on Yelp for their Downtown location and 26 reviews and a 4.5-Star rating for their Summerlin location and 18 reviews and a 4.5-Star rating for their Henderson location?